The 2015 Richard Evans Award was presented to the Scotch Road Cemetery Association, a not-for-profit profit organization dedicated to the maintenance, preservation and remembrance of the Scotch Road Cemetery, a heritage graveyard in Grenville Township, in the MRC of Argenteuil. 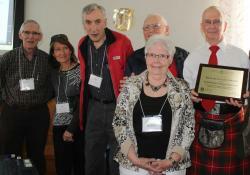 Representing the association were President Cecil McPhee and a contingent of other volunteers. Established by a group of concerned citizens who first met at the Goodland Farm north of Grenville, Quebec, in 1975, the organization’s objectives are: to preserve the Scotch Road Cemetery; to develop a greater appreciation of the part played by the early settlers who are buried in the cemetery; and to share the association's knowledge and resources regarding the cemetery. Scotch Road, in the Township of Grenville, was originally settled by Highland Scots in 1802. These first Europeans to settle northeast of the Ottawa River came from the Isle of Mull and Lochaber and were Presbyterian and Gaelic-speaking. By 1820, the farming village of Scotch Road (situated on one of the oldest roads in the region) was established and soon there was a school and a post office. As the years passed, however, the families left the rocky farms for better employment and education. Eventually, all that remained was the cemetery. Scotch Road’s last surviving building, the Presbyterian church, was moved to Kilmar in 1931, and later to the Val Carroll Resort. In the 1970s, descendants of some of the original Scotch Road settlers came to visit the cemetery and to record data from the stones. The cemetery, they discovered, contained some of the oldest surviving tombstones in the Laurentians (the earliest, that of Archibald McPhee, dated to 1818). The visitors found the cemetery suffering from years of neglect and vandalism. The most recent burial, at that time, had been in 1948. Over the past 40 years, members of the Scotch Road Cemetery Association have worked diligently to maintain and preserve this early community burial ground, which is now completely surrounded by second- or third-growth forest. Stones have been re-erected and repaired, a gate and fence installed, and a monument to the history of Scotch Road put in place. Members of the Association have organized clean-ups, and remain vigilant about access and conditions at the cemetery. In 2014, members of the cemetery association, led by President Cecil McPhee, successfully confronted the town council of Grenville-sur-la-Rouge regarding proposals about the road and possible development in the area.